I promise I have plenty of things to blather on about around here, including the fact that Kidlet One started kindergarten this month! However things have been nuts and we’re learning a new routine in addition to the smaller two not sleeping well at night. Once things calm down, I’ll get all chatty and talk about all the new things going on. 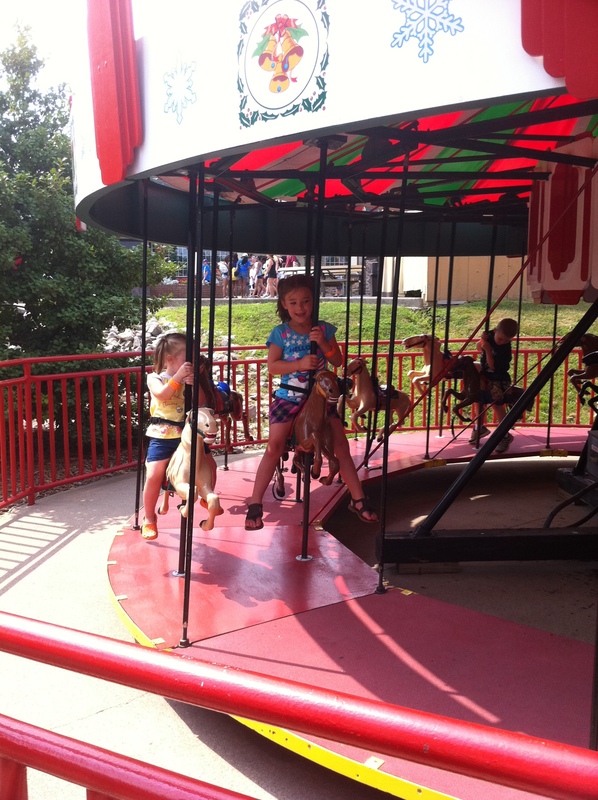 At the end of July, we did our annual trek to Holiday World for some summer fun. Despite it being a Tuesday, the place was packed. We had a great time. When we arrived, the kids rode some rides in the Rudolph’s Reindeer Ranch section. 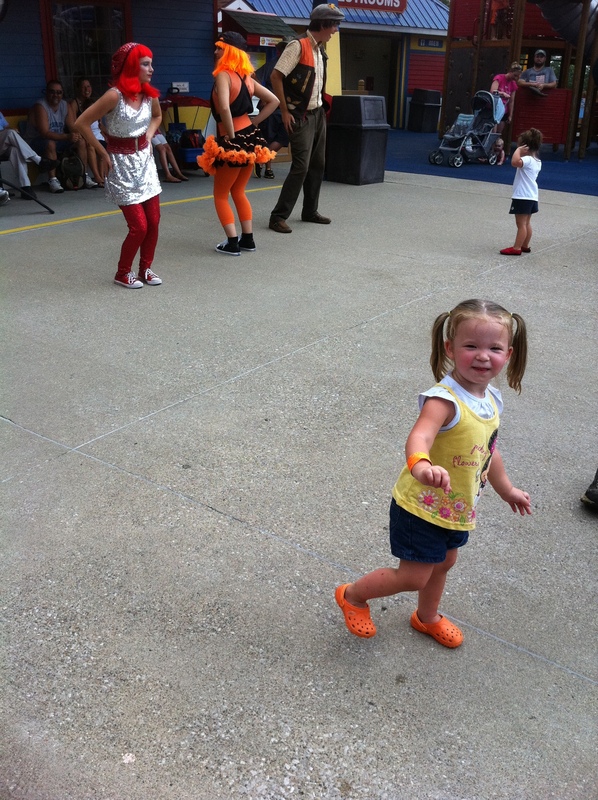 Then we went up to Holidog’s Funtown where we arrived just in time for one of the shows. Kid Two loves music and dance. She watched and watched before trying her hand at some of the dance moves. Kidlet Two trying her hand at the dance moves. We ate lunch and then headed over to Splashin’ Safari where we tried out the new Safari Sam’s Splashland. Before we even made it back to the dressing rooms to change clothes, Kidlet Two fell asleep. Once we were changed, we headed back to the regular park section where Kidlet One had a few more things she wanted to do. Kidlet Two slept while Kidlet One rode the kids rollercoaster. Everyone except the husband slept on the way home. It was an incredibly fun, exhausting day. Not that I’ve been to many theme parks, but Holiday World is definitely the best I’ve ever been to. 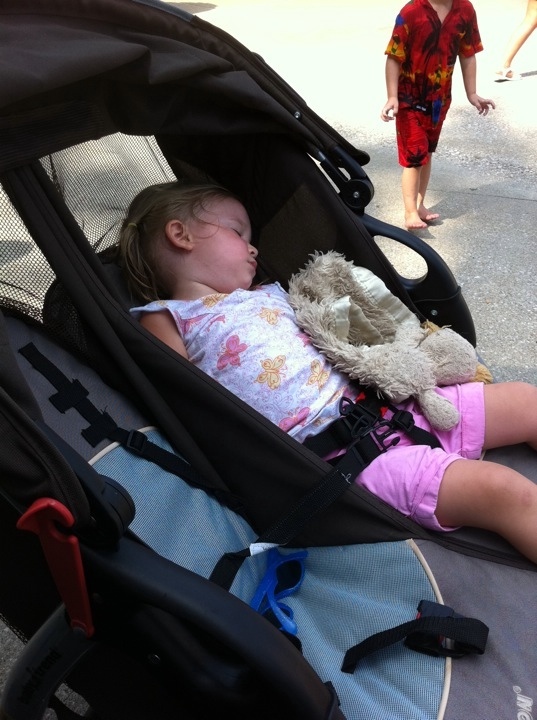 Not only is there free sunscreen, soft drinks (lemonade & water included) and wifi, but the park is clean, the staff is friendly, and there are plenty of safety features to help locate any separated children and parents. I downloaded the iPhone app before we left, but I didn’t really use it because we were all together. Also new this year were scannable bracelets that you could load money to and then use at nearly any location within the park. I think both of these features would be excellent for taking pre-teens and teens on trips to the park. Each year the park works hard to bring a great experience and they deliver every time. I love all the things we can do together as a family.